Malaysia's Minister of Public Utilities Datuk Amar Haji Awang Tengah Ali Hassan (2nd from right), poses with his delegation members at a seminar in Seoul on Jan. 11, 2012. To his left is Malaysian Ambassador to Seoul Dato’ Ramlan Ibrahim. 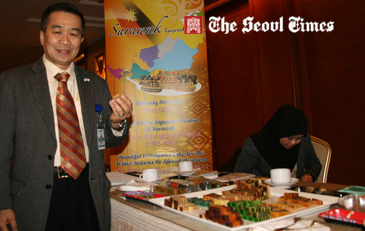 On Jan. 11, 2012, "Sarawak Investment and Timber Selling Mission" event was held at Lotte Hotel in downtown Seoul. The purpose of the event was to strengthen the relationship between South Korea and Malaysia that has been expanding for the last five years. The improvements are evident as the trade value has increased by 7.4 percent during the past five years resulting in a stronger relationship between the two nations. During the last 20 years, Sarawak has changed its ways and has begun to rely on plantation sites instead of the natural forests, thus, this concept is still reasonably new for Malaysia. Such changes will only benefit and help save the natural forests and environment in Sarawak. "Therefore only 40 percent of the logs gets exported from Sarawak," he said. The seminar's mission is to inform Korean investors of the benefits of the plantation sites and secure the technological help that Malaysia requires. The day started off with a seminar at 10 a.m., discussing the trade and investment opportunities in timber and non timber to industries in Sarawak as well as potential buyers and investors within Korea. The event welcomed businesspeople who were willing to take part, as well as encouraging participants who were walking by. Malaysia's Minister of Public Utilities Datuk Amar Haji Awang Tengah Ali Hassan (left) poses with Malaysian Ambassador to Seoul Dato’ Ramlan Ibrahim (2nd from left). 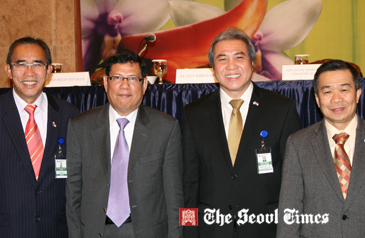 At right is Trade Commissioner Rashid Mohd Zain of the Malaysian Embassy at a seminar held at Lottel Hotel in Seoul on Jan. 11, 2012. The ambassador also stated that “Malaysia’s key is to promote timber worldwide”, as well as improving the bond between South Korea and Malaysia. Following the Malaysian envoy was Datuk Amar Haji Awang Tengah Ali Hassan, second minister of resource management and environment, minister of public utilities, minister of Industrial development, Sarawak. He is also chairman of STIDC Board of Management. He discussed the need for more collaboration between the two nations, as well as “the long history of timber relations between Korea and Sarawak.” Datuk Amar Haji Awang Tengah Ali Hassan indicated that Sarawak is the top supplier of timber as it’s the third largest revenue of the state and plays a significant role in the economy sector. In 2012 the timber business is “projected to grow 5 percent, if the prospects are supported by strong domestic demands,” stated Datuk Amar Haji Awang Tengah Ali Hassan. Trade Commissioner Rashid Mohd Zain has been with Matrade, Malaysia’s national trade promotion agency, for the last 13 years. Rashid continues to build on and strengthen the growth of Malaysian exports within Korea by linking the importers from Korea with potential exporters from Malaysia. He also acts as a focal point for the government agency and businesspeople from Korea and Malaysia in order to get information regarding business matters between both nations. South Korea is the main supplier of natural oil and gas to Malaysia as well as of electronics, whilst Malaysia contributes integrated circuits and semi conductors to the Korean market. Matrade Seoul will further help promote Malaysian exports worldwide. Sarawak’s main mission for 2012 is to enhance the relationship with South Korea, to further the timber economy explains Datu Haji Len Talif Salleh. The closer relationship will be achieved by organizing and getting involved in various events, thus, expanding out and working more closely with the Korean business community. Datu Haji Len Talif Salleh states that “the high technology of Korea will benefit Malaysia and promote new timber products”. The relationship between South Korea and Malaysia is still in the process of strengthening to further the improvements it is significant to inform Korean businesses of this investment and get them to participate. The increase of Korean companies willing to take part has positively been reflected in the relationship between Malaysia and Korea, highlighting this as one of the main beneficial actions of 2011, explains Datu Haji Len Talif Salleh. Around the end of the one-day seminar event, three separate cases of memorandum of understanding (MOU) were signed between Malaysian Timber Association and three related organizations of South Korean timber industry.